Mumbai: DHL, the world’s leading international express services provider, recently completed yet another successful season as Associate Sponsors and Official Match Ball delivery partner of the Hero Indian Super League (ISL) 2017-2018. DHL secured visibility amongst football lovers this season by engaging with over 500 million people through a 360-degree interactive brand campaign, and particularly reaching over 180 million TV viewers. In addition to Chennaiyin FC lifting the Hero Indian Super League trophy, the season finale also saw Mr. R.S. 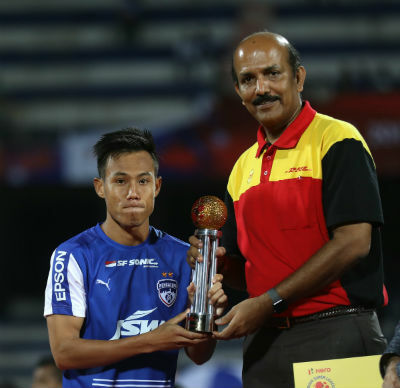 Subramanian, Country Manager of DHL Express India, handing over the esteemed ‘DHL Winning Pass of the Season’ award to Udanta Singh from Bengaluru FC for the highest number of assists in the entire season. This season, Hero Indian Super League followed a larger format with 95 matches played over the course of five months, thereby giving DHL a greater opportunity to engage with audiences on and off the ground for a longer period. DHL’s 360-degree interactive brand campaign was designed exclusively around Hero Indian Super League. As part of the partnership, DHL was the Official Match Ball Delivery partner for all games and awarded the ‘DHL Winning Pass’ to the player with the highest number of assists in each game.